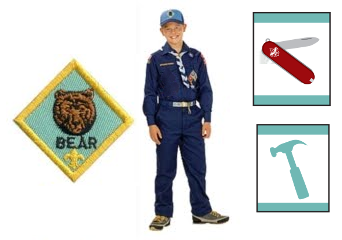 Summary If a Cub Scout has completed the second grade and has earned the Bobcat Badge, they may start earning the Bear rank. When they receive the Bear Scout handbook, they may beginning the Bear portion of the Boy Scout trail. They will also need a blue Cub Scout Uniform. This part of the Boy Scout trail is intended to take one school year, preparing the scout to begin earning their Bear rank after they complete third grade. Bear Scouts also learn about camping and being respectful of nature. Much of the advancement for the Bear rank is done by the scout with their family outside of the den. The parent signs off in the scout's handbook and the Den Leader records the advancements from the handbook in our tracking Software. The Bear program relies heavily on family involvement, but you will see this gradually change with the scout doing more with their den and more individual direction as they graduates to Webelos.